The AFP Chill Out - Always Cool Dog Mat is no longer available. You can find suitable alternatives here. Overheating can be dangerous to a dog's health. Dogs have virtually no sweat glands, and can only regulate their body temperature by panting or by sweating through the pads on their paws. A dog can only a lose a small portion of its excess body heat this way, so dogs are prone to heat stroke, which can lead to permanent organ damage, comas or even death. Could your dog use some refreshment on a hot day? All For Paws Chill Out Always Cool Dog Mat is a pleasant way for dogs to cool down. Even on the hottest days, the special gel inside the cooling pad ensures that they always stay cool. 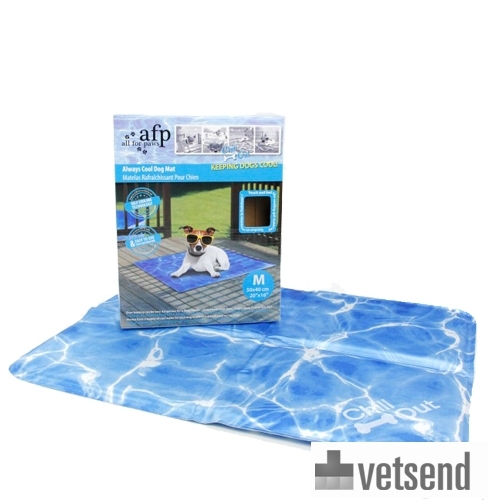 The AFP Chill Out Always Cool Dog Mat does not need to be chilled in the refrigerator, and can used at any time. The AFP Chill Out Always Cool Dog Mat is activated by the body weight of the dog. The mat is 10 to 15 degrees cooler than the temperature of the dog's environment. The cooling pad reactivates itself within a few minutes of inactivity. It is easy to clean and fold away. The cooling mat contains no chemical ingredients. Have you used AFP Chill Out - Always Cool Dog Mat before? Let us know what you think about this product.